This post was inspired by numerous discussions on Baby Led Weaning (BLW) blogs and forums where some parents are looking for ways to introduce more iron rich foods to their babies. Most BLW foods, especially in the first few weeks, are fruits and vegetables, which, although healthful and nutritious, are also low in iron. Who is at a risk for iron deficiency? Most babies are born with a store of iron to last them for the first 4-6 months. After that, iron starts to run out. If a baby was born prematurely she may not have spent enough time in the womb to accumulate enough iron in her body. This means that she may run out of her “stash” earlier than a full term baby. In this case, an iron supplement prescribed by a doctor may help meet the nutritional needs. Also, if a mom entered her pregnancy with depleted iron stores, there is not much she can share with the baby to start with, which can also put the baby at a risk for a low iron status. It is estimated that iron deficiency affects about 7% of children between 1 and 2 years of age living in the US. This number is much smaller than the number of children affected by iron deficiency in developing countries but is still a concern. In fact, in 2010 AAP issued a recommendation for a universal screening for iron deficiency at 12 months of age. Best baby food sources of iron are pureed meat and fortified cereals. Neither is a typical choice for BLW babies. That’s why experts and researches here and here are wondering whether BLW babies can get enough iron, especially in the first weeks of starting solids when they are not actually chewing and swallowing that much. Iron helps supply oxygen to cells and is especially important during periods of rapid growth. It also plays a vital role in brain development. Iron deficiency and iron deficiency anemia in small children may lead to cognitive issues and low immunity many years later. How can a baby get enough iron? Babies from 6 to 12 months need 11 mg of iron a day. This requirement is very high because they are going though a period of very rapid growth at this time. The good news is that you do not need to worry about your baby’s iron status if your baby is full term, your doctor is not concerned and you are just starting solids at 6-7 months. Although breastmilk is low in iron, its bioavailability is pretty high. And formula is fortified with enough iron to support your baby’s growth and development until 12 months, when you are ready to switch to cow’s milk. But be aware that after a few weeks of starting solids your baby will start drinking less breast milk or formula and eating more solids, so the nutrition from solid foods will be becoming more and more important with every day. Because of this, it makes sense to introduce at least a few iron rich foods from early on, so when your baby is ready to cut down on milk or formula, his iron intake is not affected. When planning meals for the baby, it helps to remember that not all iron is absorbed equally well. Iron from heme/animal sources (e.g. meat) is absorbed better than iron from non-heme/plant sources (e.g. beans or fortified foods). But there is not need to do lots of complicated calculations to find out how much iron exactly your baby is getting or absorbing from formula/breast milk and solids. Instead, focus on serving some iron rich solid foods to your baby at least twice a day. 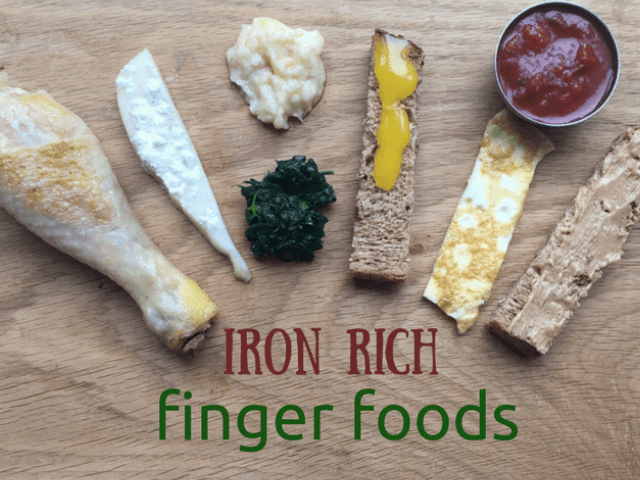 Here are some finger foods your baby can self feed using his whole hand (palm grasp). This is how babies typically start self feeding from 6-7 months. Make sure to spread the tahini very thinly. Seed and nut butter lumps are a choking hazard. Tomato sauce contains plenty of vitamin C. Just make sure to choose a low sodium version for your baby. Or make your own by cooking on a low heat some canned chopped tomatoes, chopped onions, garlic and herbs. Cook an omelet on small skillet, cut it into graspable strips and serve to your baby. Mash 1/2 cup of cooked or canned and rinsed beans with 1 teaspoon of lemon juice and olive oil each. Thin with water until it is the consistency of hummus. Let your baby go messy self feeding with his fingers or preload a spoon and give it to him. Bonus: better iron absorption due to the vitamin C in lemon juice. 5. Sautéed spinach with lemon juice. Sauté 1 cup of baby spinach in 1 teaspoon of olive oil until wilted and very soft. Sprinkle with 1/2 teaspoon of lemon juice. Chop in smaller bites to get rid of bigger pieces that may be a challenge for the baby to handle. Let your baby self feed with his hands. Have a camera ready for some green-faced cuteness :). Even if you avoid spoon feeding your baby, there is a way to use its nutritional benefit from iron fortification. Sprinkle some cereal on slippery finger foods like ripe pear, banana, mango or avocado. This will not only boost iron but also make it easier for the baby to grab and hold the food. Chicken drumstick has a perfect handle for self feeding and is higher in iron than chicken breast. Your baby may not be able to bite off and chew any of the meat yet but will have lots of fun sucking and gnawing. Other iron rich foods for your baby at this stage: strips of braised beef, slices of iron fortified tofu, fortified pasta, broccoli, large flakes of cooked fish. At 8-10 months most babies can use their fingers to pick up smaller pieces of food. They also get better at chewing and swallowing. At this point, including iron rich food in their diets becomes easier. As you can see, with a little strategic planning it is easy to make sure your baby is getting enough iron even if you avoid purees altogether. Which iron rich foods does your baby enjoy? Tell me in the comments. Hi Natalia! Thank you for all this information. I have a question:I have been smashing in powder iron fortified puffs and dusting veggies and fruits with them, you mention I can do that with the cereal (I use iron fortified baby oatmeal)as well? Can i just use them in powder form without having dissolve them in water first? Or do they need to be dissolved first? Same question if I want to cook with them. Thank you so much!!! Hi! Thank you so much for stopping by! Yes, I just use dry cereal to dust finger foods. No need to cook it. Dry is absolutely fine. If you use fortified puffs, it is cubically the same thing. Just smash them into powder and dust finger foods with them. I am not sure I 100% understood the last question, sorry. You mean cooking with smashed puffs? Thanks! Thank you so much for your prompt reply!! It was very helpful!!!! My last question was cooking with the fortified oatmeal that is in powder form and needs to be dissolved in water or milk before giving baby. Can i just cook with it as it comes in the box (powder) or dissolve in water or milk to make puree and then cook? Sorry, might not be thr smartest of questions 🙂 thank you again!!!! Thanks once more for your response!!! Your blog is a goldmine of information! One question about iron absorbtion and dairy. Is it any kind of dairy? Even a small amount? I read somewhere that if it is fermented dairy, like Greek yoghurt, then it doesn’t affect iron absorbtion. And if a child consumes an iron rich meal how long should we wait for dairy consumption to make sure iron is absorbed? Thank you so much for stopping by and your kind feedback! It is calcium in dairy that interferes with iron absorption, so fermented dairy has the same effect at non-fermented. I would say wait for an hour or so before giving calcium rich food like dairy, but only if there is a concern with a child’s iron status. Otherwise it is perfectly fine to combine both in one meal. Thank you very much for the quick reply! Most spinach recipes I find include some dairy, especially cheese, so I didn’t know if it was a good idea. It is totally fine if there is no concern with overall iron intake and the doctor is not worries about the test results. Hope it helped a little :). Hi Helen. It is calcium that may interfere with iron absorption. But if there is no concern about your daughter’s iron status, mixing them is just fine, especially if she is eating some vitamin C rich foods close to that meal (vitamin C improves iron absorption). I only recommend being very careful with calcium if kids are low in iron. Hi there! It is sooo frustrating to hear contradictory information all the time. As a mom, I take solid scientific evidence, add my family food values and measure by our family lifestyle, in order to determine which recommendation to go with. So, with this taken into an account, dairy is not an essential food group, but it’s ok to include it into a balanced diet. Brassicas and legumes contain certain type of carbs that affect digestion in some people, but it’s not true for everyone. And iron recommendations, although may be far from perfect, are the results of the best science we have right now, so I stick with them, especially considering that iron defficiency is the most common nutrient defficiency in the developed world. But I am 100% with you, I just wish we had solid answers to every question. I also wish we had mnore reliable sources of information on the internet. At the moment, I try to make the most responsible use of the latest science and provide real life recommendations for parents.